Review posted March 26, 2015. I always feel a little skeptical about Louise Hay's claims that different ailments in the body come from attitudes within us. And then I have an ailment come to my attention, and her description of the attitude behind it is spot on. Seems like it can't hurt to pay attention -- and I do find that the affirmations are good for my spirit. It's not a stretch to think they might be good for my body, too. Time after time, the book made sense, but I could never figure out where Louise got her affirmation system. What motivated her, nearly 35 years ago, to start her "clinical observation study" on the association between human thoughts and health? How could someone with no scientific background or medical training observe client after client, see a consistent correlation between certain thought patterns and their associated health problems, and then write a book that so accurately addresses our health concerns? Her prescriptions worked but I didn't know why or how. It simply drove me crazy. So, as necessity -- or aggravation -- is the mother of invention, I decided to delve into the science behind her affirmation system, mapping out the emotional aspects of illness in the brain and body. And the correlations I found helped me create a treatment system that has guided me through more than 25 years of intuitive consultations and an equal number of years as a physician and scientist. 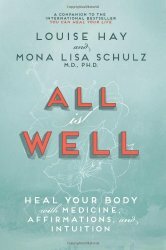 When Louise and I began our discussions about how to create the most useful book for you, we decided to structure it so you could look up the part of your body that is experiencing illness and work from there -- just like in You Can Heal Your Life. However, you must remember that people are not simply individual organs bound together, so the illness in one part of your body will generally affect the health of another part. And emotions about feeling safe and secure in your family (first emotional center) also play into emotions about self-esteem (third emotional center). To fully heal, you must look at your life as a whole while giving extra attention to the organ or illness that's causing you the most trouble. Feel free to flip directly to the part of the book discussing your personal problem area, but remember that you may also find important information about other imbalances in your life by reading through the entire book. Having a complete picture of your strengths and weaknesses can help you create a long-term plan for a healthy life in all your emotional centers. As you work your way through the book, I'll help you tap into your body's intuition surrounding the organs in each emotional center so you can understand the messages your body is sending. But remember, only you can decide what your body is really telling you. This book is a general guide that matches what is commonly seen and what the science mostly supports. After you have determined what your body is telling you, Louise and I will walk you through healing techniques that address the numerous reasons why we get sick. While we won't give specific medical advice in this book because good medical advice is unique to each individual, we will provide case studies that give you an idea of some of the basic types of medical interventions to consider. More important, we will lay out affirmations that you can repeat to yourself multiple times throughout your day and behavioral suggestions that you can immediately incorporate into your own life. These tools will help you change your thoughts and habits to create health. Now, when I read You Can Heal Your Life, what made it seem plausible to me was when I was diagnosed with a gynecological problem with a "non-healing wound" shortly after my husband left me. Coincidence? Or is there something in what Louise Hay says? I also realized that the affirmations she prescribed for that did soothe my spirit. In this case, I was reading along happily, not feeling it was applying much to me -- when I had a scan done to check on my previous vertebral artery dissection. In the same area of my neck but opposite side, they found tissue growth that shouldn't be there. Long story short, I did eventually have a biopsy done and learned that it is "Reactive Lymphoid Hyperplasia" -- an overgrowth of lymphoid tissue, possibly from infection somewhere else in my body. The important point being that this is Benign and Not Cancer. However, it was interesting that this was in the same part of my neck as the injury that caused my stroke three years earlier. And a few days after the initial finding, I happened to read the chapter in this book titled "Something to Talk About: The Fifth Emotional Center: Mouth, Neck, and Thyroid." Now, the first sentence made me think it didn't apply to me: "The health of the fifth emotional center indicates how well you communicate in your life." Communication? I'm good at that. Problems of the neck are often found in people who -- even if they have flawless communication skills on a regular basis -- become inflexible and frustrated when they are unable to control the outcome of a situation. Once your neck is healthier, some fundamental changes must occur to maintain equilibrium while moving forward. Learning to accept your emotional limitations in the middle of a discussion is one key to improving your neck problems. You do have an amazing skill for intuitively listening, understanding, and making logical arguments. However, you must accept where your intellectual power to reason and communicate ends. When you encounter conflicts that you can't resolve, don't push your opinion stubbornly, adding to the frustration of the situation. Instead remind yourself that there are multiple answers to every problem. Realize that your role is only one part of the solution. Finding balance between what you can control and what you can't and knowing when it is time to walk away from conflict will lead to better health in the fifth emotional center. Oh my goodness, these things apply to me. In fact, I was hoping they didn't. But when I told my sister some of what I'd been reading, ready to say I thought they might possibly apply to me -- she immediately laughed out loud in recognition! Well, I thought by now I'd let him go. I've even started dating. However, the fact that these words struck such a chord makes me think the authors are onto something. And again, the affirmations they prescribe for this do feel healing and soothing. I actually adapted the main ones slightly to something that deeply resonates for me: "I love my family and friends enough to let them make their own mistakes and choose their own paths." So let me close this review by saying I think you'll find it's worth a look. And it certainly can't hurt. What is your body telling you?